Photograph of the entrance to a pagoda at Bassein (Pathein), Burma (Myanmar), taken by an unknown photographer in about 1880 part of the Dunlop Smith Collection: Sir Charles Aitchison Album of Views in India and Burma. Bassein is a premier port city in the Delta region of Burma, a major centre of trade and noted for its handicrafts. It became part of British Burma in 1852. The entrance is a long covered walkway leading to the pagoda, crowned by a series of tiered wooden roofs with ornate spires known as ‘pyat-that’. 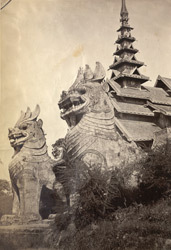 This is a close view of two giant chinthes or leogryphs, Burmese temple guardian figures, which flank the entrance. The Shwemokhtaw is the main pagoda at Bassein. It is one of three which according to legend were each built at the command of a Muslim princess by her three lovers.